When is it ok to split an RG6 cable? We can lay this out for you very easily. Splitters are not the enemy when you’re running RG6 cable. However, there are some very specific times and places when they should be used. If you have a DIRECTV SWM system (which you probably do if you got in installed since 2009) you can use green-labeled splitters to split the cable. You don’t want to use more than two splitters in a row, though, because every time you split the cable, you also split the signal and eventually the amount of signal will get so low that you won’t get enough. If you have an older DIRECTV system, the ONLY time you can use splitters is prior to a multiswitch, and they have to be used in a very specific way. Our White Paper will tell you more about that. 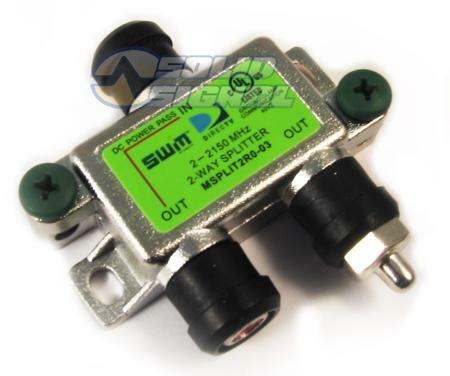 You cannot use splitters to add another receiver. DISH allows for splitters to be used to add Joey clients for a Hopper system. It shouldn’t be necessary in a residential setup to use them to split out to multiple multiswitches because DISH multiswitches can be cascaded. In other words you can run cables from one multiswitch to another, to another. If you are using a non-Hopper system you can’t use splitters, and that’s pretty much the whole story there. If you have an antenna, you can’t exactly split an infinite number of times but you have a lot more flexibility. Inexpensive splitters can be used to split the signal, and it’s easy to tell if you’ve over-split… you’ll see the picture break up. Just add an inexpensive distribution amplifier and you’ll probably be ok.
What is a dB and why is it so confusing? Why are there so many different connectors on cables?